I decided this week to make a bake that I knew my boyfriend would like, after making a mocha marble cake last week, he doesn't love coffee cake, so I thought I would do one that would be a definite winner! This recipe came from one of my Hummingbird Bakery books, which I absolutely love, the recipe is a super easy one but these cupcakes are so much fun, great to make for friends or to take to a party! 1. Preheat the oven to 170 degrees C, line a muffin tin with paper cases. 2. To make the sponge, mix the butter, flour, sugar, baking powder and salt together until they form a crumb like consistency. 3. In a jug, mix together milk, eggs and strawberry milkshake powder. 4. Gradually pour half the liquid into the crumb mixture and mix until thoroughly combined. Pour in the remaining liquid and mix until smooth and combined, scraping down the sides of the bowl. 5. Spoon the batter into the paper cases, filling two thirds full. Bake for 20-25 minutes until the sponge bounces back when lightly touched. 6. Leave to cool slightly before removing from the tin, place on a wire rack to cool completely. 7. To make the frosting, cream the butter until smooth, add the icing sugar and combine. In a jug, mix together milk and strawberry milkshake powder. 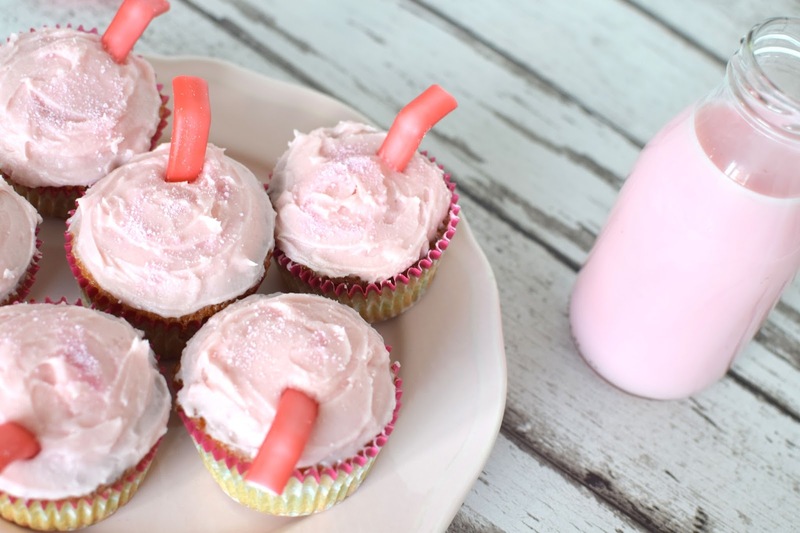 Gradually pour the liquid into the frosting, beat until light and fluffy. 8. 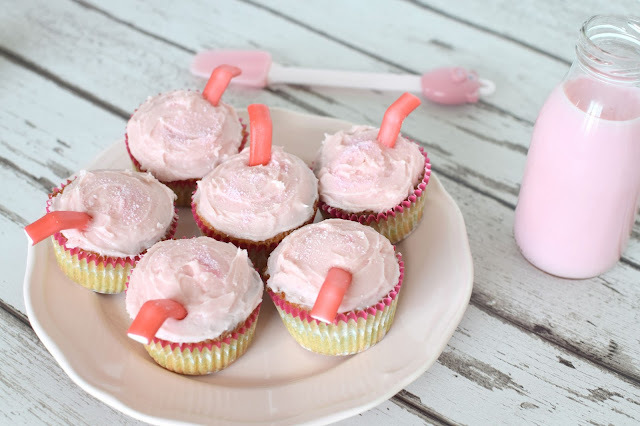 Spoon frosting onto each cupcake and smooth down with a palette knife. Sprinkle over milkshake powder. 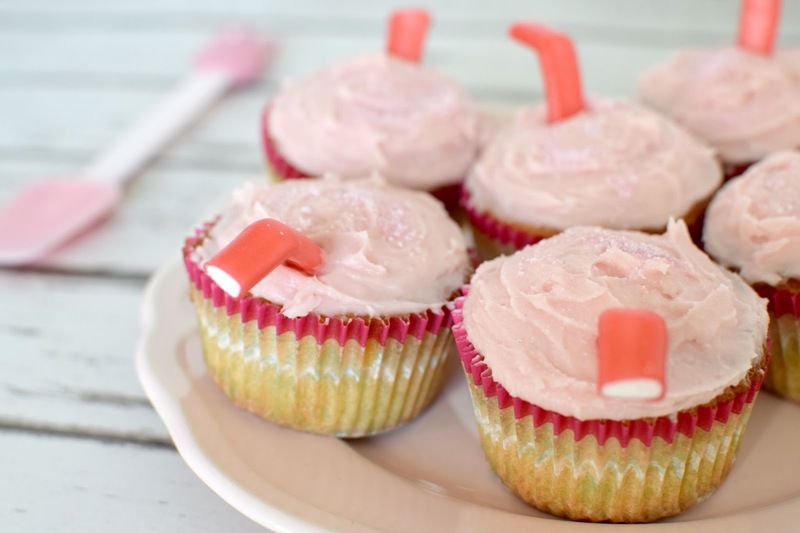 Cut up strawberry pencils and bend, stick them into the cupcakes to resemble straws. These looks absolutely delicious - must have a go at making these!